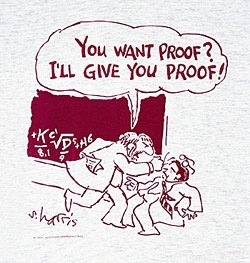 This great Sidney Harris cartoon reminds me of the Big Bang Theory scene where Sheldon and Leonard end up wrestling during a conference presentation by Leonard. It’s also a handy antidote for anyone with an idealistic picture of scientists and how science is done. The human, but real, behaviour of scientists seems to be a current theme in recent discussions of the nature of science by historians and sociologists. That’s not a bad thing in itself – much of the old history may have given an unrealistic and idealistic picture of science as it was done in the past. Let alone now. I enjoy reading about the history of science and am really pleased that biographies of famous scientists are no longer hagiographies. These days we often learn about the personal foibles and character flaws as well as the great discoveries. It doesn’t in any way destroy my picture of science to learn about Newton’s or Einstein’s character or personality defects, or about the affairs, professional jealousies and outright bad behaviour of science icons. And my own professional experience has certainly taught me about the social and political influences on science and science funding. Given that current science history tends to be a “warts and all” coverage, and that modern scientists also experience the real sociology of science day-to-day I am a bit surprised that some UK historians and sociologists recently took it upon themselves to lecture us about this (see Historians and sociologists lecture scientists – about science) As if scientists had a naive, idealistic picture of how they do science! Mind you – it did start me thinking. These historians and sociologists are assuring us that they perform an important function. Revealing, and reminding us, of the social and political influences on science. And of the real non-algorithmic nature of the scientific process. Of the real scientific method. These historians think they play a key role in keeping scientists honest – perhaps they do. But who plays this role when it comes to history and sociology? Who has described the social, political and ideological influences on the history and sociology of science? And has anybody been reminding the students and practitioners in these fields of those influences on their ideas and teachings? Perhaps we need to remind ourselves that historians and sociologists are just as human as scientists. They also are prone to personal emotions and vanities. They are exposed to social, political and ideological influences. And they probably have less opportunity to validate their ideas against reality than do their scientist colleagues. Galileo is of course a key figure in the history of science – but one whose history and significance is contested among historians (although scientists generally accept his important contributions to scientific method and astronomy). Some historians really seem to hate the guy. They downplay his contributions, often appearing to argue against them. They will concentrate on his mistakes (all scientists make mistakes), set impossibly high standards of proof for his ideas and even now seem to favour alternative discredited ideas. Paula E. Findlen, Stanford University describes “the trial and condemnation of Galileo” as having been “debated, and reinterpreted for over three and a half centuries. We are not yet done with this contentious story.” So true. The historian of science Maurice Finocchiaro has detailed this debate in his book Retrying Galileo, 1633-1992 . A shorter version is in his chapter of Ronald Number’s collection Galileo Goes to Jail and Other Myths about Science and Religion. I am sure much of the controversy could be sheeted back to ideological motivations and that would be a fascinating study. But the persistent controversy among historians about the “Galileo Affair” underlines the fact that one should not take on faith the history presented by a single historian. Some historians of sciences adamantly promote the myth that Christianity gave birth to modern science. The ideological bias is pretty obvious here but again this is an area where one should not just take the word of a single historian – no matter how much they assure you their view represents a consensus of their profession. For an overview of that particular myth Noah J. Efron has a good chapter, That Christianity Gave Birth to Modern Science, in Ronald Number’s collection Galileo Goes to Jail and Other Myths about Science and Religion. Efron chairs the Program in Science, Technology and Society at Bar-Ilan University in Israel and serves as President of the Israeli Society for History and Philosophy of Science. Just imagine that we had an equivalent of the Intergovernmental Panel on Climate Change (IPCC) – but for history and sociobiology instead of climate science. Maybe then historical and sociological controversies could be resolved and the consumer may really get a consensus view. But I am sure there would still be sceptics/contrarians, deniers! Well if we are talking sociology and anthropology what do we make of all the references to extraterrestrials throughout history ? Beginning with the first human written language of the Sumerians and their references to Aliens written down. The references in the bible and the Hindu texts. Fiery chariots, flying craft. Egyptian hieroglyphics of space vehicles, the list goes on. As well as the youtube clips, of wormhole craft and orbs, the phoenix lights, Kaikoura lights in New Zealand, The valley in Norway where they set up a camera to record.. So much evidence but so much denial. What has this got to do with the issue covered in my post? well quite a bit if you draw parallels. The Earth spins around the sun. The ancients knew this aeons ago and the church science told us the sun revolved around the earth. Sure the majority of humans at the time believed this to be true, because most people are quite happy not to question convention and to believe what they have been told by the authority. I am trying to get some discussion going, the theme seems to be same religious theme, that you seem to do (bash the bible bashers, I have no problem with this but when you are talking belief systems, we should question our own ). I would like to discuss this alien topic by drawing a parallel with Galileo and his struggle to present evidence against the church. We have faith that science is correct in it’s theories but have no way to explain anti gravity, UFO’s are taboo. Questioning conventional science is like in Galileo’s day questioning the church. So it is a divergence from Galileo but I am sure you can see a parallel, now I have pointed it out. Derek, you are completely wrong. This post covers the dispute that arose in the UK from the criticism of a New Statesman editorial by Brian Cox and Robin Ince which argued that scientific knowledge should not be compared with mere opinion. The editorial was criticised by a historian and a sociologist arguing they were in a better position to describe scientific knowledge and the scientific process than were Cox and Ince. You say you want to “get a discussion going.” I suggest you do the honest thing. Establish you own blog and provoke as much discussion as you wish. Please don’t try to divert discussion here onto to your own unrelated obsessions.